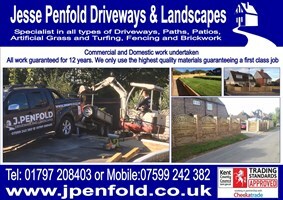 Jesse Penfold Driveways & Landscapes - Driveways/Patios/Paths, Landscaper based in Brenzett, Kent. Hello, my name is Jesse Penfold we are a family run business.We have over 50 years experience in ground work such as Driveways, path and patios we also specialise in artifical grass and turfing, fencing and brickwork. Commecial and domestic work undertaken and all work guarenteed up to 12 years. We're always striving to deliver an efficent, reliable and prompt service to my customers. Feel free to visit and like our Facebook page!